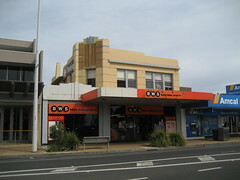 The BWS store in Dromana started life in 1937 as Littleton Bros General Store and a residence for the Littleton family. By the seventies the premises had become Dromana Cellars and still serves that function under the Beer, Wine & Spirits brand. 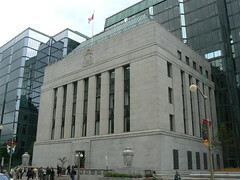 On our day trip to Ottawa during the Montreal World Congress on Art Deco we stopped for good look at the Bank of Canada building in Sparks Street. 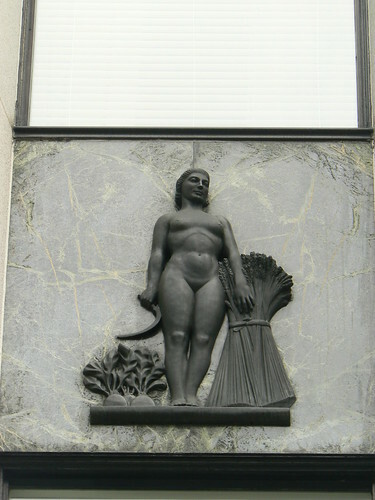 The building was designed by SG Davenport and completed by Mariani, Lawson & Morris. 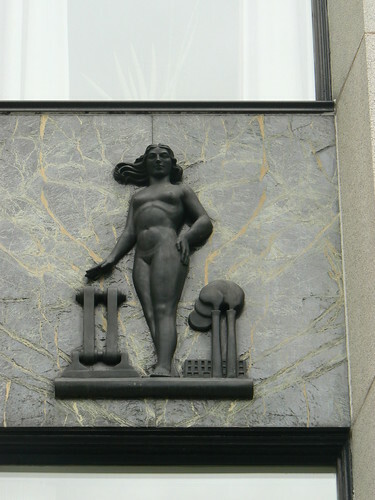 It was constructed 1937-38. 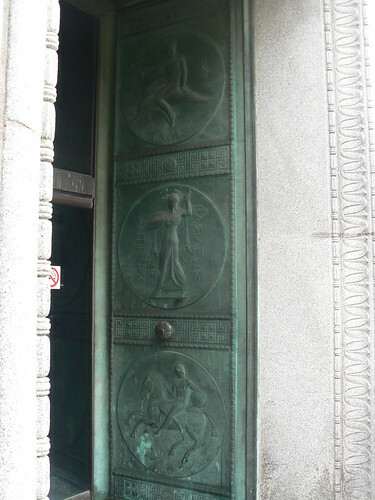 The bronze front doors bear panels designed by Ulysses Ricci based on Greek coins. 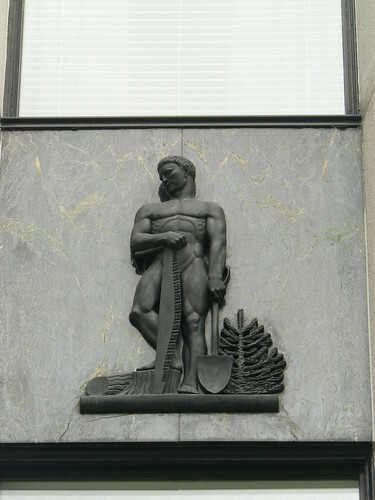 The facade is decorated with a series of seven figures by Jacobine Jones representing the principle industries of Canada. 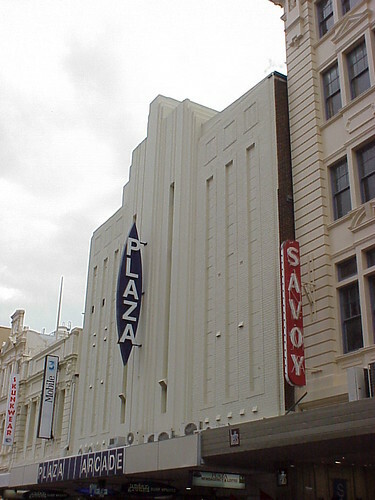 The Plaza Theatre and Arcade by architect William G Bennett dating from 1936-37. Yesterday I took part in the Save Live Australian Music Rally from the State Library in Swanston St to Parliament House in Spring St at the top of Bourke St. 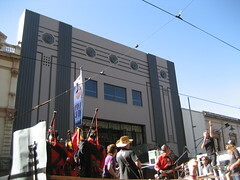 The SLAM Rally came together as a protest against the current interruptation of the Victorian State Liquor Licencing regulations that are lumping small live music venues with no history of violence as 'high risk' venues along with large beer barns and nightclubs some of which do have a history of violence. 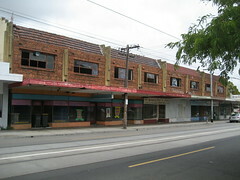 The requirements for extra security under the regulations have already forced The Tote in Collingwood to close. 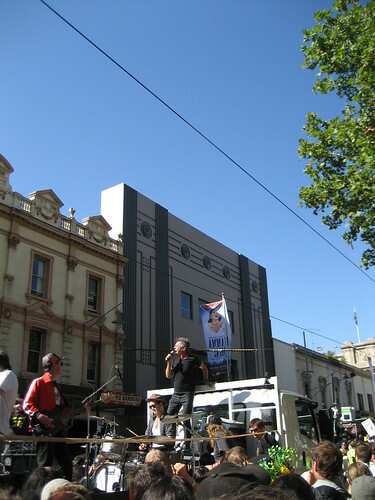 The Rally took the form of the a recreation of AC/DC's classic 1976 clip for "It's a Long Way to the Top (If You Wanna Rock n Roll)". 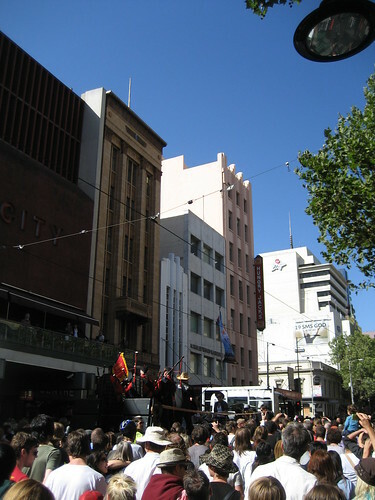 In that clip, AC/DC played from the back of flatbed truck driving down Swanston St accompanied by three pipers. Yesterday, the part of AC/DC was played by Brian Nankervis and the RocKwiz Orkestra and a few 'ring-ins' including Kram from Spiderbait. They also had three pipers including two of the players from the original clip. The rally was a huge success and the State Government have already promised to work with live music venues to resolve some of the unintended consequences of the Liquor Licencing reforms. Now I know that people come to this blog to see Art Deco buildings so if you ignore the truck as it makes its way up Bourke St and look at the buildings in the background you'll see the former Bank of NSW (1929) with the Egyptian decoration at the roofline, the much smaller former Rockman's Department Store (1937) and the former Michael's Corner Store (1934-35) ... hmmm ... on the corner. 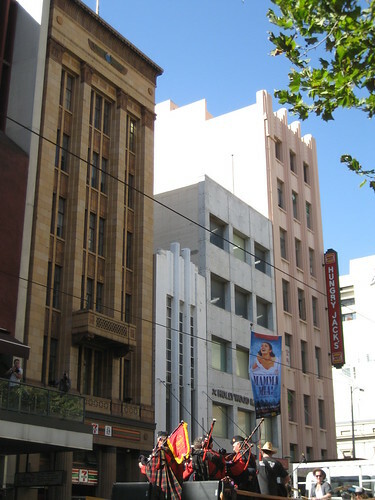 And further along Bourke St, this is the former Metro Cinema now the Palace Theatre which features live music on a regular basis. Caversham Court on the Esplanade in Mornington looks like it is a Nursing Home or Sanitarium but it is, as I've found out, a block of flats. 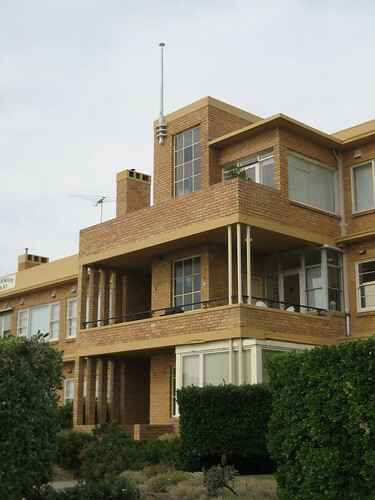 The Mornington Peninsula Shire Council Heritage Study prepared in 1994 by Graeme Butler & Associates lists that Caversham Court was designed in 1947 by architect CG MacKennal and built the following year. The block consists of 10 separate flats throughout the two and three storey building. Sometimes you are meant to take a wrong turn! While out driving yesterday we did indeed take a wrong turn and ended up smack up against the Patterson River in a dead-end next to the former Carrum Fire Station. 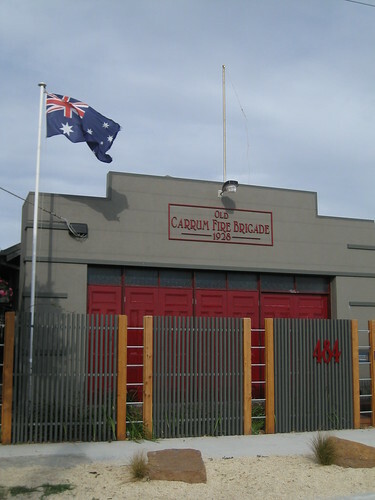 Dating from 1928, until recently it housed the local Country Fire Authority (CFA) firefighters. 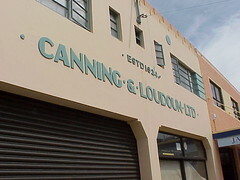 In May 2007 it was bought by Todd & Rebecca Schwarz who converted it into two warehouse-style apartments. 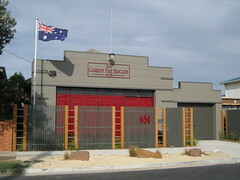 They've done a great job retaining the look of the old fire station yet it is plainly now a residence. The fire engine red doors are an obvious feature but I think the incoporation of ladders into the front fence is a nice touch. 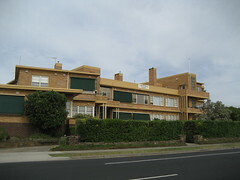 Their story was featured in the Mordialloc Chelsea Leader newspaper in May 2009. 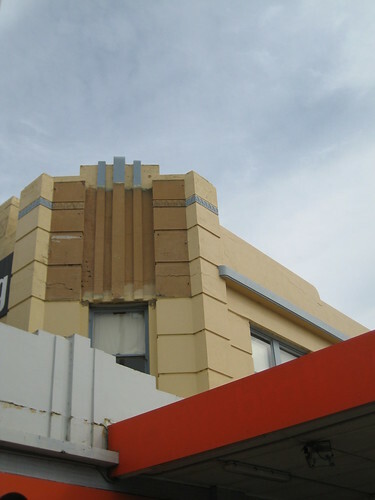 With the Art Deco Weekend now in full swing, I thought I'd show you another of Napier's deco buildings. 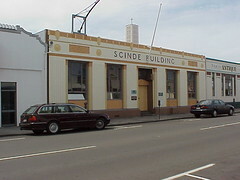 From information in the Napier Art Deco Inventory, the Scinde Building in Tennyson St was designed initially in 1932 by EA Williams with HA Westerholm followed by further work in 1933 by Finch & Westerholm. 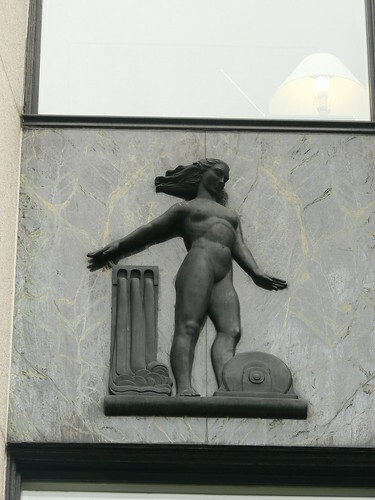 This weekend sees the annual Art Deco celebration in Napier. Napier is a fabulous Art Deco city on the North Island of New Zealand rebuilt in the prevailing architectural style of the period after the devastating 1931 earthquake. 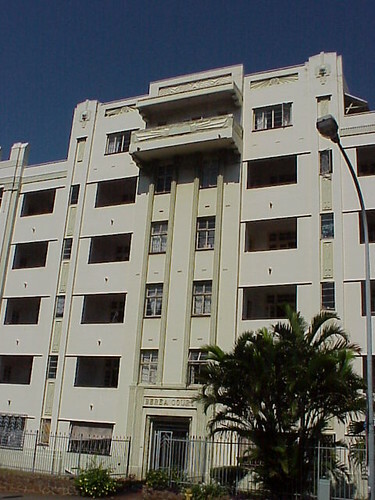 A example of the simple deco structures all over the Napier CBD is the Canning & Loudoun building. 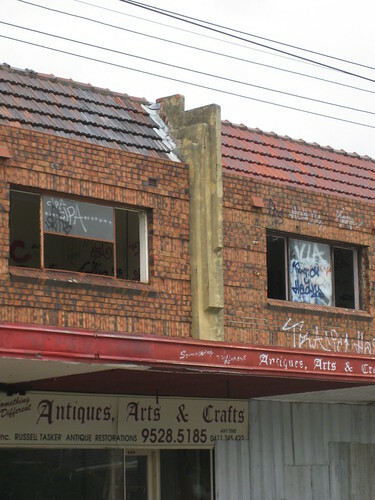 Although the facade of the garage in Tennyson St reads 'ESTD 1924', the building dates from after the earthquake. 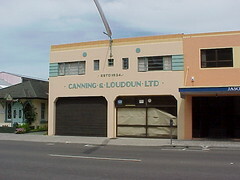 According to the Art Deco Inventory, originally compiled for the Art Deco Trust in 1991 with the 2nd Edition (after several revisions) now available on the Napier City Council website, this garage was constructed in 1936 and designed by architect EA Williams. Details from the inventory indicates that the building was originally Salmon Motors and was sold to Canning, Loudoun & Derry for £500. 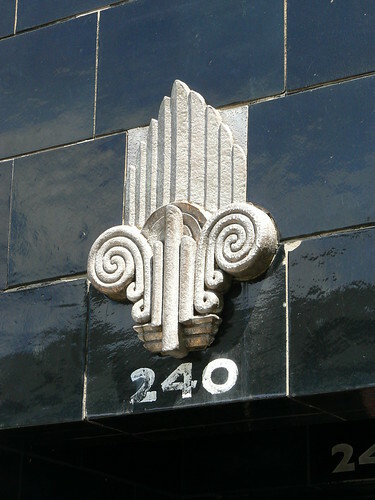 Everyone who loves Art Deco should get to Napier for the Art Deco Weekend at least once in their life. The website lists the dates for the Weekend up to 2014 so there's no excuse to at least get it on to your wishlist. 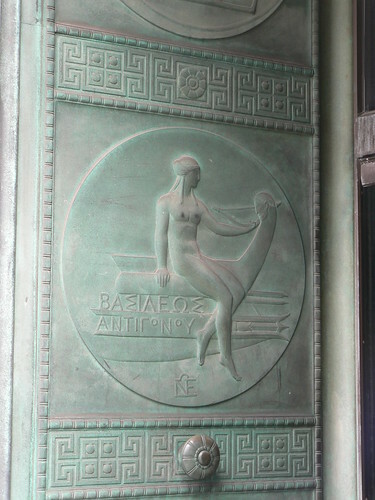 So what do you do when a car-load of Australians pull up in the middle of the day in front of your theatre in Rochester, NY, jump out and start taking photos and pointing out various Art Deco details accompanied by suitably appreciative exclamations? No, you don't run for cover, since they've come so far, you invite them in for an impromptu tour. 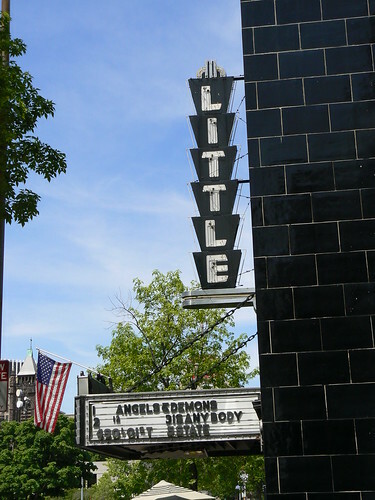 The Little Theatre opened in 1929 as part of the 'little cinema movement', an attempt in the 1920s to cater for an audience interested in more experimental ideas than the typical Hollywood movie. 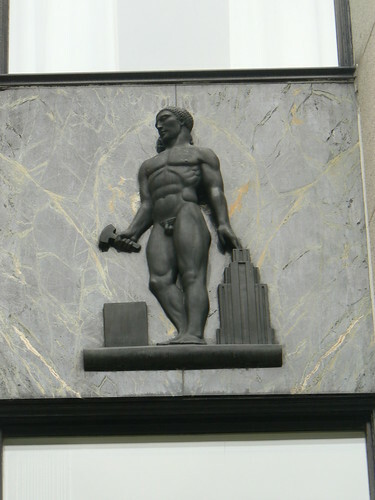 The black Art Deco building was designed by local architect Edgar Phillips and Frederick Pike, an architect from nearby Buffalo. 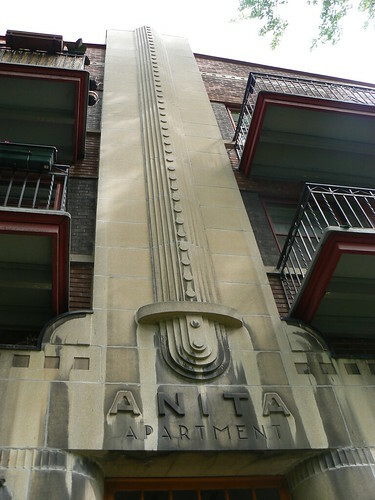 The facade has Art Deco details highlighted in silver against the black tiles while the 'Little' name is spelt out on a series of trapezoid shaped panels sitting perpendicular to the face of the building. 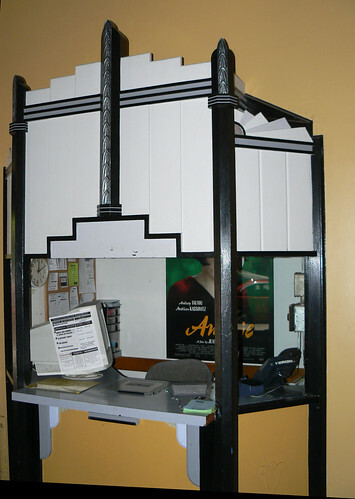 Inside, the Little Theatre, retains many Art Deco features including the ticket box and the seating in the stalls. 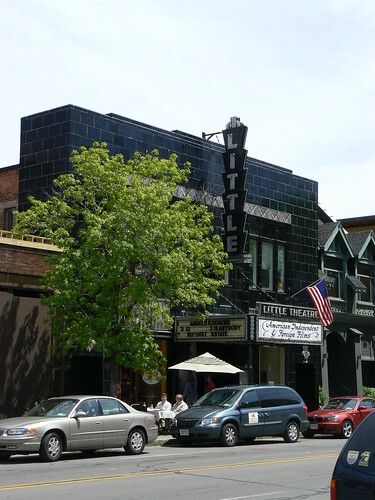 Today the Little Theatre operates as a 501(c)(3) not-for-profit organization relying on community financial support through its membership program and other fund-raising activities. Tulsa artist Celeste Vaught has posted an interview with me on her blog. 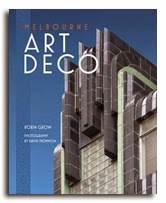 The interview covers my passion of Art Deco and aspects of my visit to Tulsa for the 2001 World Congress on Art Deco. While you are there, have a look at Celeste's project Tulsa Brick x Brick where she is the heritage of Tulsa architecture through her paintings. Thanks Celeste and I love what you are doing with Tulsa Brick x Brick. 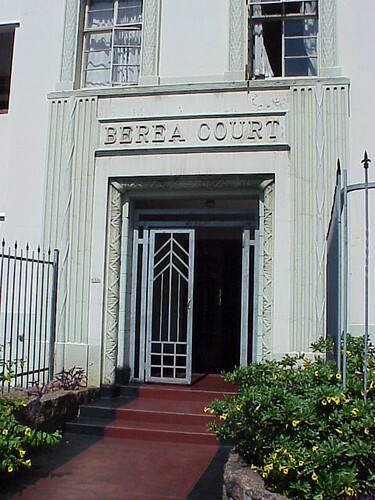 Berea Court (1935) was designed by architects Langton & Barbourne and sits on a busy thoroughfare in Durban. 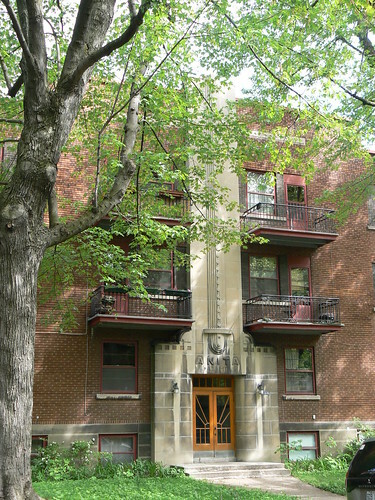 The face of the building features lions heads, stylised sunbursts and a single balcony on the top floor. 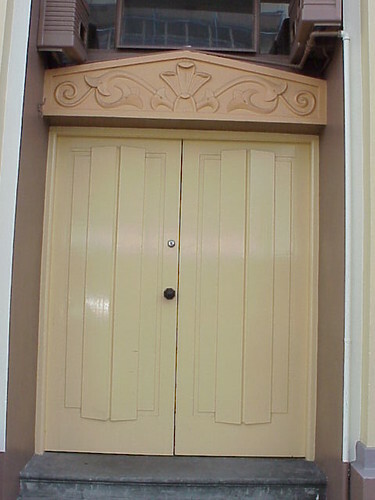 The entrance is very handsome and the addition of a modern security gate has been done in a respectful way. 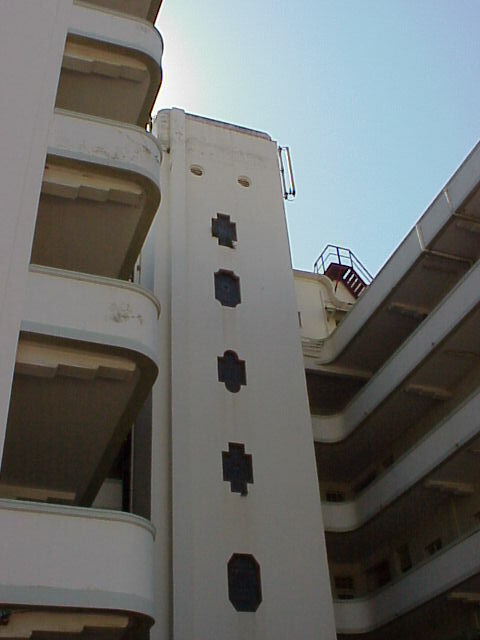 At the rear, the apartments are accessed via long cantileveled walkways while the liftshaft features a variety of geometric shaped windows. 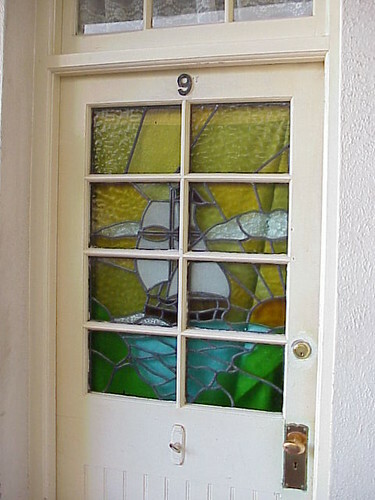 One of the main features of Berea Court however, is the nautical themed leadlight windows in the apartment doors on the lower floors. 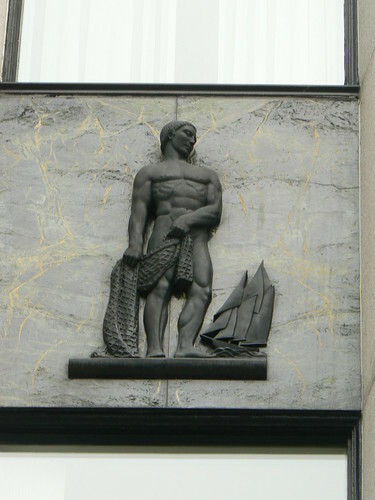 They are all different with ships on some and lighthouses on others. 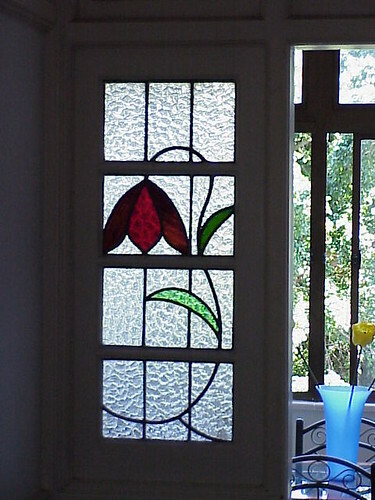 On the upper floors the leadlight windows are simple floral forms, a theme that is repeated in the interior doors. 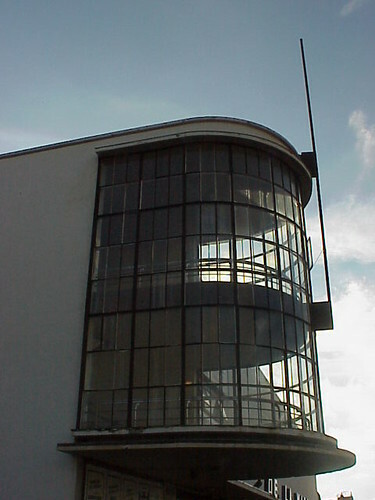 The De La Warr Pavilion in Bexhill-on-Sea was designed by architects Erich Mendelsohn and Serge Chermayeff and opened to the public in 1935. 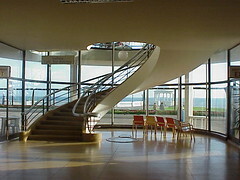 It is named after the 9th Earl De La Warr who commissioned its construction. 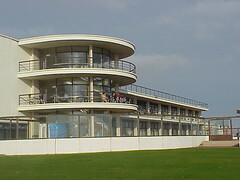 The pavilion is a truly striking building, one of Britian's first Modernist public spaces. 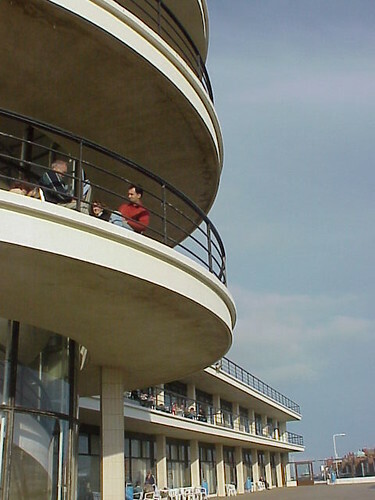 The most interesting part of the building is the three storey circular section with open-air balconies with sufficient space for deckchairs. 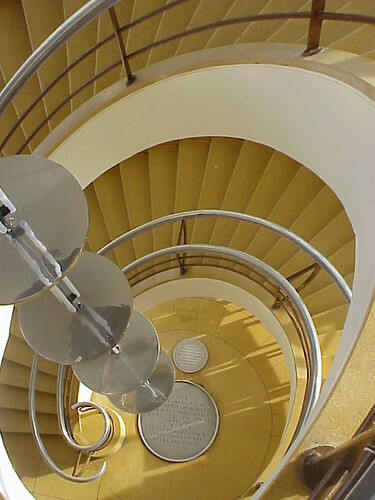 It houses a series of curving staircases that wrap around a large pendulum light and provide access to each level. I am straying into very dangerous territory here. 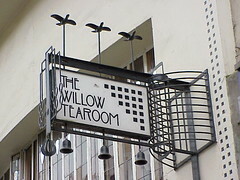 The Willow Tea Rooms in Sauchiehall Street, Glasgow were designed by Charles Rennie Mackintosh in 1903 for Kate Cranston. 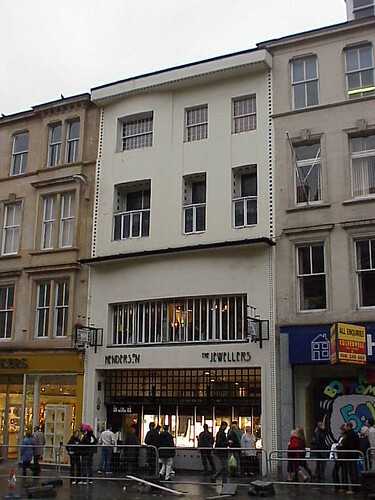 Mackintosh had already worked on Cranston's three other Glasgow tea rooms working on murals, furniture and at Ingram Street redesigning an entire room to create the White Dining Room. 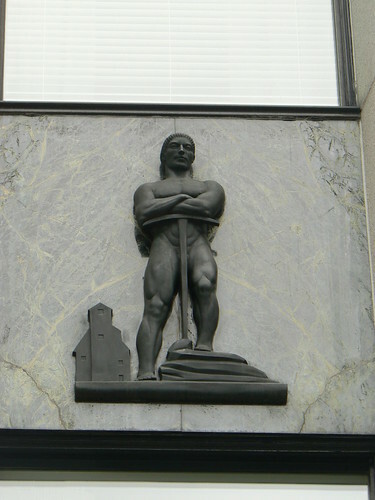 The Willow Tea Rooms was the first time he had complete control over the entire building. By 1917, Kate Cranston had sold her tea rooms and the buildings were used for other purposes until Anne Mulhern recreated the Room de Luxe at the reborn Willow Tearoom in 1983. 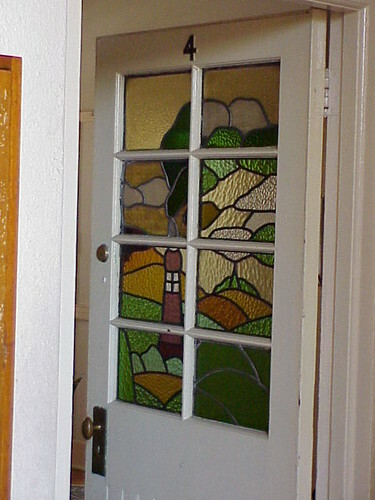 The work of Charles Rennie Mackintosh cannot be claimed to be Art Deco but he was a genius and a man before his time. I came across this rather sad sight in Hawthorn Road, Caulfield this afternoon. A row of deco shops, all empty, one shut up with security shutters and upstairs broken windows and graffiti covered walls. In one of the shops the ground floor was covered with discarded files and folders. I don't know what is in store for this stylish block of shops but I suspect it isn't good news. 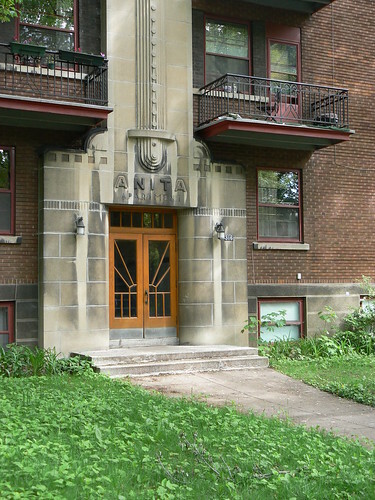 I love the entrance to Anita Apartments in Montreal. 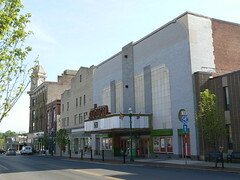 The Schine Theatre (1938) in Auburn, NY was designed John Eberson, a specialist theater designer for the Schine Brothers as part of their extensive theatre chain. 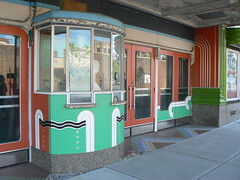 At Auburn, Eberson's design included comets and shooting stars and vivid colours which can still be seen in the doors and ticket box. 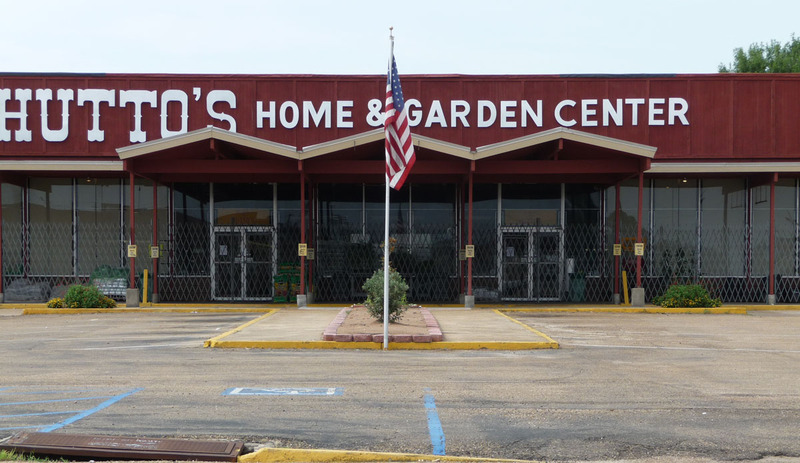 The building ceased to be a cinema in 1979 and after various uses, finished up as a video store that closed in 1992. 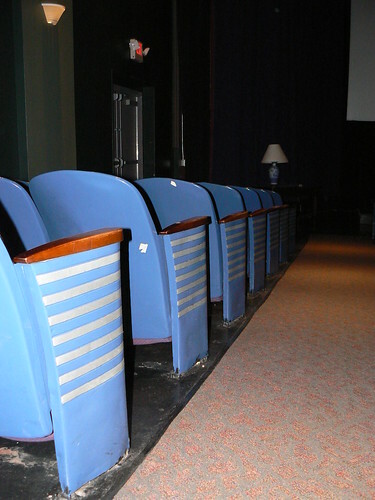 For several years it remained vacant and was purchased by the Cayuga County Arts Council in 1998. The Arts Council are working to restore the theatre and make it a viable arts and entertainment hub for Auburn. I wish them luck in their future plans for this wonderful theatre.